It’s fall. The air has turned crisper. It’s still dark at 6.30am. The leaves hang suspended in the air, as though awaiting their fate. Some have turned yellow. Some will turn into a bright red. In past years, I’ve bundled my entire family into the car and we’ve set off to look at the changing landscape. Whenever we’ve thought about moving to a warmer, sunnier climate, I’ve thought to myself “but what about fall?” The trees appear so dressed up, so bedecked, as though for the grandest ball of the year, that I almost cannot bear to miss seeing them. Each tree looks different. When I look upon a hill, the blanket green having given way to individual reds, yellows, oranges that spring up in relief, I wonder how I would never have been able to see that tree and that tree had it not been for the changing colors of the leaves. Then there are apples, pumpkins and winter squashes of all types. I love sugar pumpkins and butternut squash. This year prettily patterned carnival squash and sweet, deep-orange and meaty kabocha have made appearances in my pappu charu, pulusu and aloo kaddu. This year we will be home for all of October. I’m terribly nostalgic for the years past. 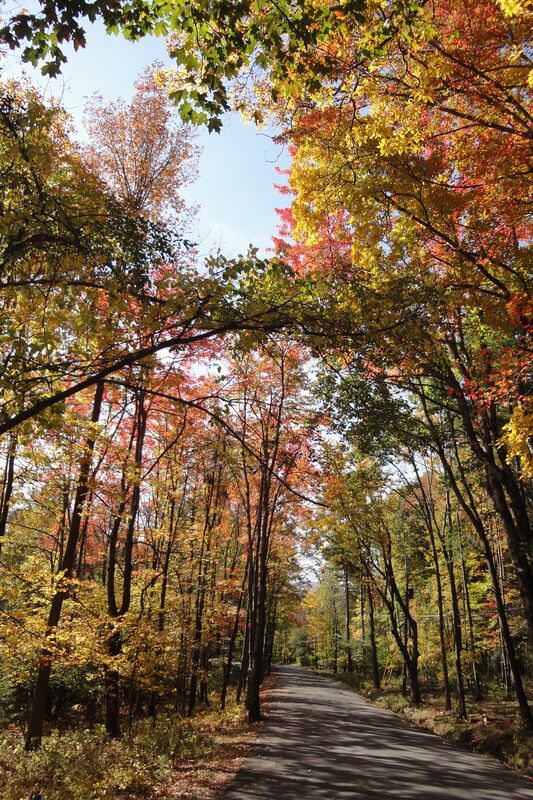 I’ve therefore decided to write out, briefly, three of my favorite fall day trips below. I also want to share a recipe for an easy maple-walnut cake that I have *invented. * It tastes so good, that it’s very difficult to not want to eat it all in one sitting. 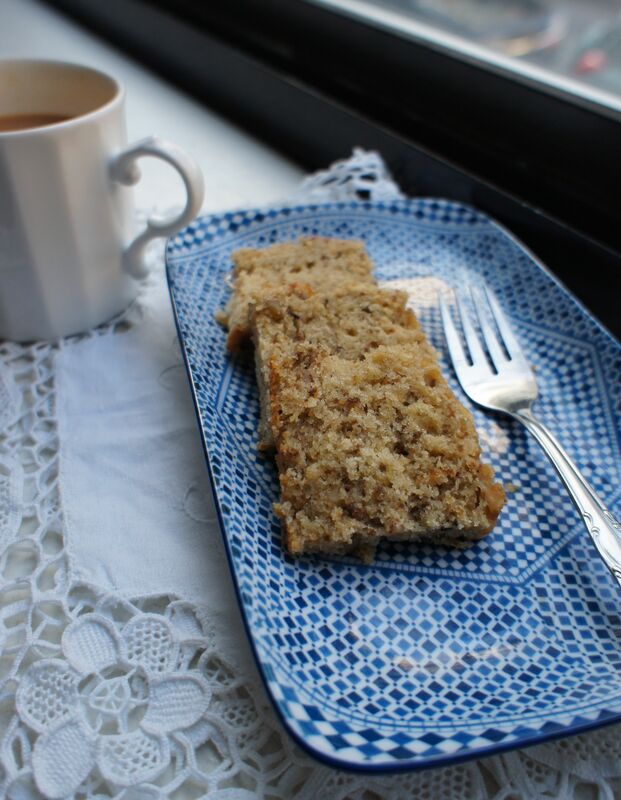 If you have a jug of maple syrup sitting in your fridge from a spring maple syrup trip, walnuts lying around for the healthy snack that they make and some good quality vanilla extract, then this cake will be easy to whip up in moments. This cake has taken a few tries to get perfect – and I’m particularly proud of how moist, walnut-y, vanilla-maple-toffee in flavor it is. 1. Kent, CT: Take the Taconic State Parkway, which will be particularly beautiful at this time of the year, to reach Kent in the Connecticut Berkshires. Drive across the antique covered Bull’s Bridge to Route 7 that becomes Main Street. Kent is full of treasures: the House of Books with a lovely children’s reading room, a charming toy store, Belgique Patisserie that offers a fabulous selection of pastries and chocolate. Further north on Route 7, stop to take the brief hike up to breathtaking Kent Falls before reaching Ellsworth Hill Orchards to pick apples and pumpkins. 2. New Paltz, NY: The I-87 will bring you to New Paltz, which offers beautiful views of the Shawagunk Mountains. Enjoy a leisurely lunch at the quaint Village Tea Room with its excellent baked goods and local food, before heading over to Minnewaska State Park for stunning views of Lake Minnewaska or a hike to Lake Awosting, time permitting. 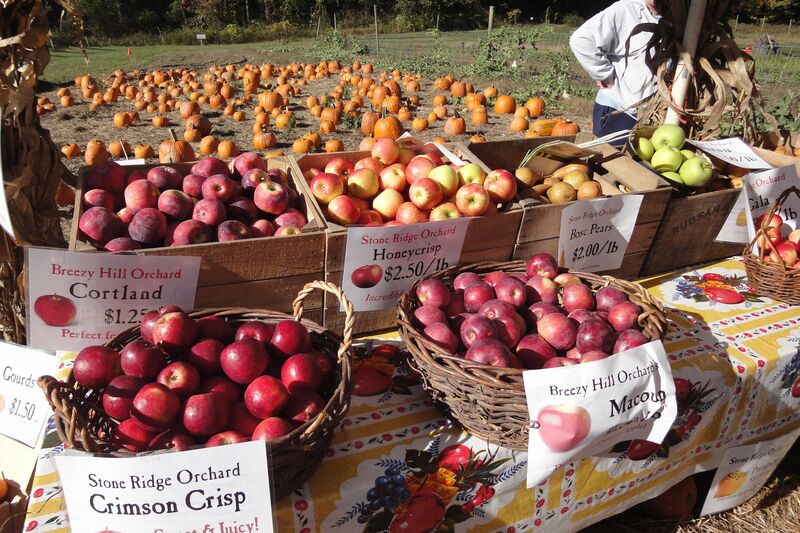 Spend some time picking apples at Stone Ridge Orchards. Before heading home, shop for local dairy and produce at the High Falls Co-op. 3. 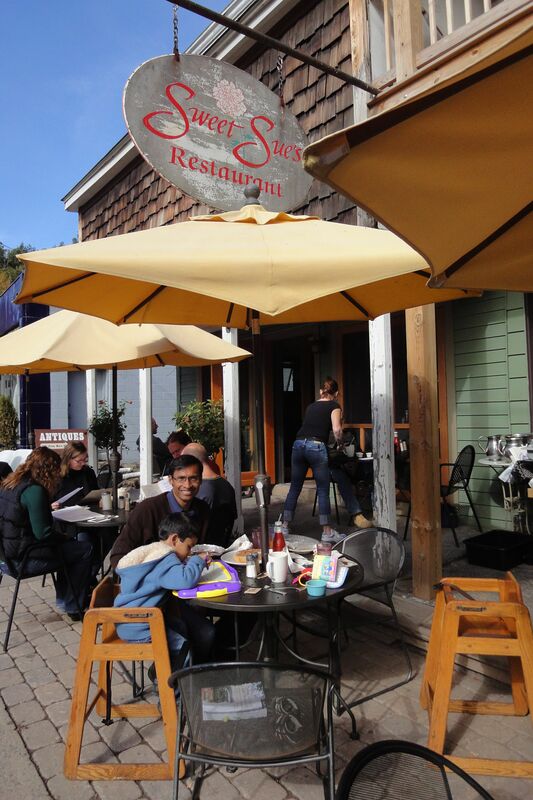 Woodstock, NY: Woodstock, nestled at the base of the Catskill Mountains, is an upbeat little town. Eat lunch in Oriole9’s light-filled dining room, with its lovingly crafted food made with local and seasonal ingredients. Bread Alone Cafe makes delicious sandwiches. Spend some time browsing the stores along Woodstock’s main street, including the fascinating Tinker Toys Too. Drive to the little village of Phoenicia, for fabulous views along the way with a mandatory stop at Sweet Sue’s for their famous plate-sized berry pancakes or a fresh-baked fruit muffin. The Woodstock Inn offers accommodation a block behind Main Street, right next to a stream that cascades into a waterfall. When driving back to the city, eat lunch at Love Bites Cafe in Saugerties for thoughtfully put together sandwiches, salads and soups, and hearty oatmeal cookies. For children: The Woodstock Animal Sanctuary, The Woodstock Wonderworks playground, Andy Lee Fields (a short walk from the center of Woodstock). 1. Heat the oven to 350F. Whisk the flour and baking powder and keep aside. Butter and flour a 9 x 5 loaf pan. 2. Toast the walnuts over a low flame in a small skillet until a faint aroma of walnuts is released. Remove and allow to cool. Crush coarsely on a flat surface with a rolling pin. Now collect the walnuts in a bowl and rub a little flour into the walnuts. This will help them to stay suspended in the batter while baking. 3. With an electric mixer on the lowest setting, cream the butter, sugar and maple syrup for about a minute. Add the eggs one by one until fully incorporated. Add the vanilla essence. 4. Now gently mix in the flour in two parts, alternating with the milk. Don’t over-stir. Fold in the walnuts and pour the mixture in the baking pan. Bake for 30 minutes or so until the cake turns a deep golden brown on top and the sides pull away (the edges will be darker). A tester poked into the middle of the cake should come out clean. Remove from the oven, allow to cool for 10 minutes, run a knife around the edges and then upturn. Loved the cake, article, pics! Hey,which flour do you use in this cake? All purpose?